Memorial Day has come and gone, and while the weather this week doesn’t make it feel like Summer, June means schools are closing and Angelenos will soon begin flocking to Southland beaches. Back in 1974, June got off to a very splashy start for the Southern California Rapid Transit District. The RTD launched its summer “Street Fleet on four new bus lines (605, 606, 607 and 608) to carry people from different parts of Los Angeles County to Santa Monica. The motorcoaches were specially decorated to look like submarines, painted battleship gray along with bright blue waves to create the appearance of churning through the ocean as they rolled down the street. The fleet was even decked out with conning towers on top to replicate housing of periscopes to reinforce the nautical theme. Line 605 picked up its “crew members” throughout the San Fernando Valley, Line 606 served Pasadena and Altadena, Line 607 departed from East Los Angeles, and Line 608 carried riders from Compton and Watts. The service was even promoted with it’s own minute-long video (above, and here), accompanied by its own impossible-to-forget theme: “Come Ride On The RTD With Us.” (The music and lyrics can be found here). Summer beach riders were reminded that they were allowed to bring their surfboards directly onto the buses. However, luring surfers to transit was not limited to the Street Fleet in 1974. The 1976 Proposed Sunset Coast Rapid Transit Master Plan was yet another ballot initiative proposing hundreds of miles of heavy rail and light rail lines serving 43 cities in Los Angeles County. 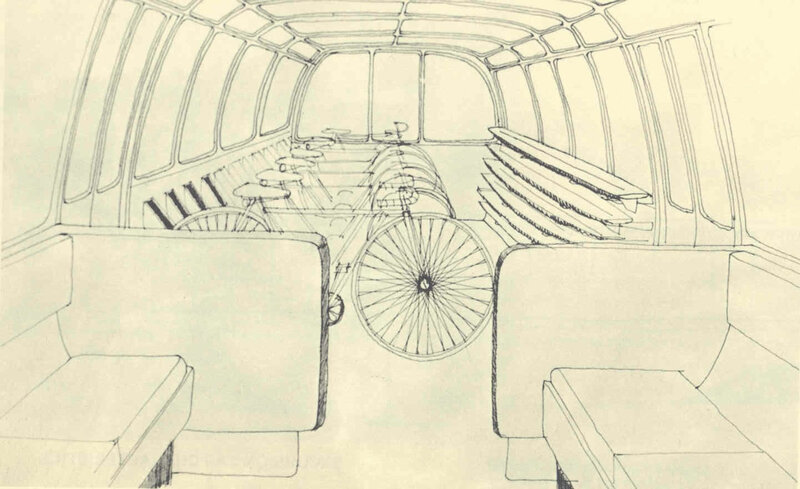 A limited number of rail cars would have included bicycle and surfboard storage at one end, as shown here. A small percentage of the equipment for the system would be specially designed to accomodate special travel purposes. The Pacific Electric system did not simply die — it was killed. Deliberately or accidentally (and there still is a dispute), it was riddled by grade crossings and outflanked by freeways until there was not enough pulse to push the Red Cars. The tragedy in its passing is that its fine network was not preserved. Only a fraction of its old routes still are identifiable today. Los Angeles might be having a love affair with the auto, but after 30 years, there is not a flicker of feeling for the bus. At least SCRTD shows some creativity in inciting that flicker…or at least making the bus a cool transportation option for getting to the beach. But this fact remains: Only thirteen years had passed between the last Pacific Electric streetcar run in 1963 and this 1976 report lamenting the streetcar system’s demise — when Baxter Ward (Chairman of The County Board Of Supervisors) proposed rebuilding a vast rail network — the “Route Of The New Red Cars” — all over Los Angeles County.